Update: This blog entry is also available on the Guardian local site for Cardiff - hoorah! That was a very traditional and to be frank, rather unoriginal way to engage with the public - but you have to start somewhere. Last Monday night, I went to Buffalo Bar to see a completely different type of public engagement. Stand-up comedy done by university lecturers. The Bright Club has finally made the journey across the Severn and had its first outing in Cardiff. Their tag line is "Where funny meets brains" and started in University College London. Two of my colleagues were performing, and the line-up as a whole was marvelously scientist heavy with a cosmology professor, a retired physics lecturer, a neuroscience post-doctoral researcher, and a medical physicist. Giving a lecture to an audience of students at 9am on a Monday morning is pretty tough crowd. You would think these esteemed colleagues of mine would be well accustomed to this type of situation. Well, the key difference is that if you are not funny while giving a lecture, there is still a good chance that your lecture was successful. I would be very pleased to have any of my students heckle during a lecture. There were nerves, slight lapses in concentrate, a failed demonstration, and the perennial hunt for the projector remote-control but I am very pleased to say that for the most part all the acts went down very well. I was rather surprised and relieved that my colleagues, who are both funny chaps, could translate their natural wit into an 8 minute set. One routine, by Peter Coles was about the make up of the Universe, and how cosmology is the study of nothing, but really interesting, exotic, wacky nothing. My other colleague, Mike Greenhough, based his routine around a graph of age against time and how different people draw the graph differently if, for example the want to stay 21 for a number of years and then jump straight to 36. Both were fluid and captivating. It was a great experience which I hope will be repeated with more academics taking the stage. My ideas for bring science to the public have changed a lot in the years since 1997 and they might even tempt me to put on my metaphorical clown shoes next time. I am not sure I would be brave enough to stand up in front of the public and try to make them laugh. 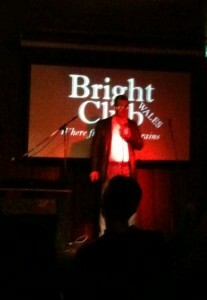 Fortunately the Bright Club audience was very friendly with only polite hecklers. Much like a bunch of students in a lecture, only with more drinking.